Does Obama Have a Positive Economic Legacy? I’m not a big fan of Obamanomics. We’re going through the weakest recovery since the Great Depression. Income and wages have been stagnant, particularly when compared to previous expansions. And while the unemployment rate has finally come down, that’s in part a consequence of people dropping out of the labor force. The net result is that our nation’s output is far lower than it would be if economic performance had simply matched the average for previous business cycles. And that translates into foregone income for American households. Yet the President seems to think that he deserves applause for his economic legacy. Here are some excerpts from an AP story in the Oregonian. President Barack Obama is not shy about defining his achievements and casting them in the most positive light…on Monday Obama offered a rare glimpse at how he wants history to judge his presidency, letting the “L” word cross his lips as he touted the U.S. economic recovery… “Obviously there are things that I’ve been proud of,” he said. He first cited the economic crisis he faced upon assuming office in 2009. “It was hard, but we ended up avoiding a terrible depression,” he said. You won’t be surprised to learn that I have a different perspective. I was on CNN earlier this week and expressed my disappointment with the President’s policies and their impact on the nation. To be fair, I’m focusing in the interview on the strength (or lack thereof) of the recovery. Obama, by contrast, wants credit for the fact that the 2008 recession didn’t turn into a depression. Needless to say, there aren’t alternative universes where we can see what would have happened if Obama didn’t get to the White House. And it probably wouldn’t matter even if there were alternative universes since neither McCain nor Romney had a substantially different vision anyhow. But here’s why I think it’s absurd for Obama to take credit for avoiding a depression. Simply stated, it takes a lot of mistakes, on a sustained basis, to produce a depression. And that’s precisely what we got from Presidents Hoover and Roosevelt. Thanks to protectionist policies, higher tax rates, a bigger burden of government spending, and massive intervention in markets, a normal downturn was magnified and extended to last an entire decade. So I suppose we could give Obama credit for not being as bad as Hoover and Roosevelt, but that’s an extreme case of damning with faint praise. And even faint praise is probably unwarranted since Obama wanted more statism and was stopped by the 2010 election. The bottom line is that Obama wants people – based on zero evidence – to believe a depression would have occurred naturally in the absence of his policies. The more realistic assessment is that Obama’s policies have been a net negative for the economy. But as I remarked in the interview, I’m not making a partisan argument. Bush’s policies also were a net negative. By comparison, you can look at Reagan and Clinton for examples of Presidents who increased economic freedom during their reigns. P.S. Since today’s topic is the economy, here’s a grim reminder of one of the reasons why growth has been relatively anemic. 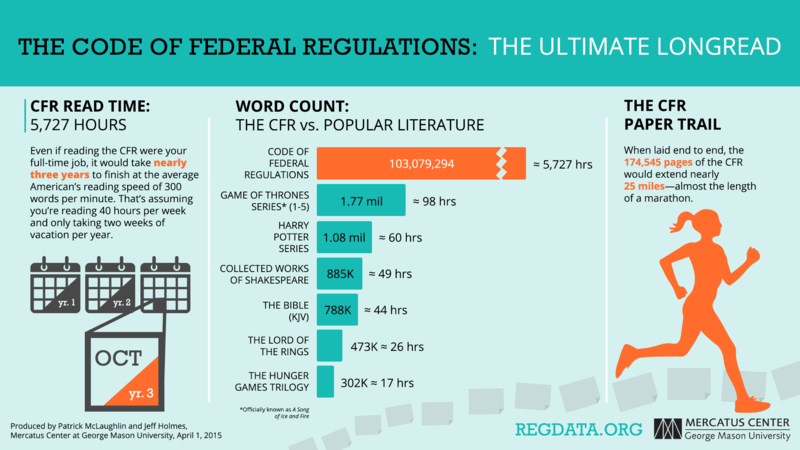 The folks at Mercatus have put together a pictograph on the regulatory burden. Something to keep in mind when considering the degree to which red tape is constraining growth and entrepreneurship. Those are very wise words, especially when we think of the damage politicians have done because of their impulse to “do something” when the economy stumbles. The problem is not that there is nothing that needs to be fixed. The problem is that the crowd in Washington is far more likely to make things worse rather than better. And who better to explain this than Thomas Sowell. Sowell starts his most recent column by explaining that politicians who want to “do something” almost always want to expand the burden of government spending, but he notes that this approach has meant deeper recessions and more economic suffering. And he cites Warren Harding as an example of a President who rejected the notion that bigger government was some sort of economic elixir. …you might think that the economy requires government intervention to revive and create jobs. It is Beltway dogma that the government has to “do something.” History tells a different story. For the first 150 years of this country’s existence, the federal government felt no great need to “do something” when the economy turned down. Over that long span of time, the economic downturns were neither as deep nor as long lasting as they have been since the federal government decided that it had to “do something” in the wake of the stock market crash of 1929, which set a new precedent. One of the last of the “do nothing” presidents was Warren G. Harding. In 1921, under President Harding, unemployment hit 11.7 percent — higher than it has been under President Obama. Harding did nothing to get the economy stimulated. Far from spending more money to try to “jump start” the economy, President Harding actually reduced government spending. Can we learn any lessons from Harding’s anti-Keynesian approach? Assuming we want more growth and less unemployment, the answer is yes (and we can also learn the lesson that Hoover was a moronic statist from the very beginning). President Harding deliberately rejected the urging of his own Secretary of Commerce, Herbert Hoover, to intervene. The 11.7 percent unemployment rate in 1921 fell to 6.7 percent in 1922, and then to 2.4 percent in 1923. It is hard to think of any government intervention in the economy that produced such a sharp and swift reduction in unemployment as was produced by just staying out of the way and letting the economy rebound on its own. Bill Clinton loudly proclaimed to the delegates to the Democratic National Convention that no president could have gotten us out of the recession in just one term. But history shows that the economy rebounded out of a worse unemployment situation in just two years under Harding, who simply let the market revive on its own, as it had done before, time and time again for more than a century. That’s a stunning statistic, akin to cutting more than $1.5 trillion from today’s bloated federal budget. Sowell also cites the achievements of the Gipper. Since I’ve posted some powerful comparisons of Reaganomics and Obamanomics, this is music to my ears. Something similar happened under Ronald Reagan. Unemployment peaked at 9.7 percent early in the Reagan administration. Like Harding and earlier presidents, Reagan did nothing, despite outraged outcries in the media. The economy once again revived on its own. Three years later, unemployment was down to 7.2 percent — and it kept on falling, as the country experienced twenty years of economic growth with low inflation and low unemployment. The Obama party line is that all the bad things are due to what he inherited from Bush, and the few signs of recovery are due to Obama’s policies beginning to pay off. But, if the economy has been rebounding on its own for more than 150 years, the question is why it has been so slow to recover under the Obama administration. By the way, Sowell also could have mentioned what happened in the United States immediately after World War II. The Keynesians were predicting a return to depression because of big reductions in government spending and the demobilization of millions of troops. But as Richard Vedder and Jason Taylor explained for the Cato Institute, the economy quickly adjusted and rebounded precisely because politicians didn’t revive the New Deal (and, as you can see from this video, President Reagan understood this bit of economic history). Sowell also explains how FDR made a bad situation worse in the 1930s. A great myth has grown up that President Franklin D. Roosevelt saved the American economy with his interventions during the Great Depression of the 1930s. But a 2004 economic study concluded that government interventions had prolonged the Great Depression by several years. Obama is repeating policies that failed under FDR. In previous posts, I have cited both Sowell and the Wall Street Journal to make this very point, but I also call your attention to this post referencing the seminal work of Robert Higgs, as well as this video on the pernicious role of government intervention in the 1930s. Last but not least, check out this video to understand more about FDR and his malignant views. P.S. Fans of Professor Sowell can read more of his work here, here, here, here, here, here, here, here, here, here, here, here, here, here, here, here, and here. And you can see him in action here. On this day last year, I posted two charts that I developed using the Minneapolis Federal Reserve Bank’s interactive website. 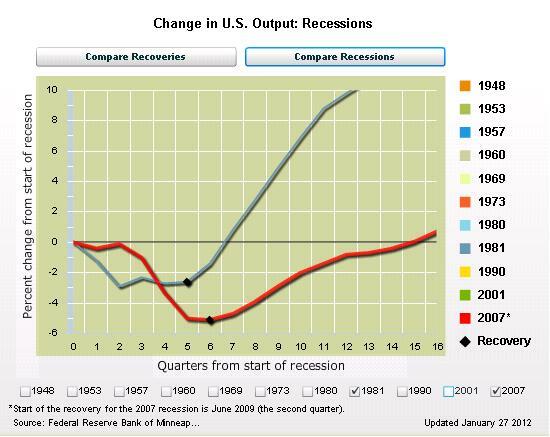 Those two charts showed that the current recovery was very weak compared to the boom of the early 1980s. But perhaps that was an unfair comparison. Maybe the Reagan recovery started strong and then hit a wall. Or maybe the Obama recovery was the economic equivalent of a late bloomer. So let’s look at the same charts, but add an extra year of data. Does it make a difference? Let’s start with the GDP data. The comparison is striking. Under Reagan’s policies, the economy skyrocketed. Heck, the chart prepared by the Minneapolis Fed doesn’t even go high enough to show how well the economy performed during the 1980s. 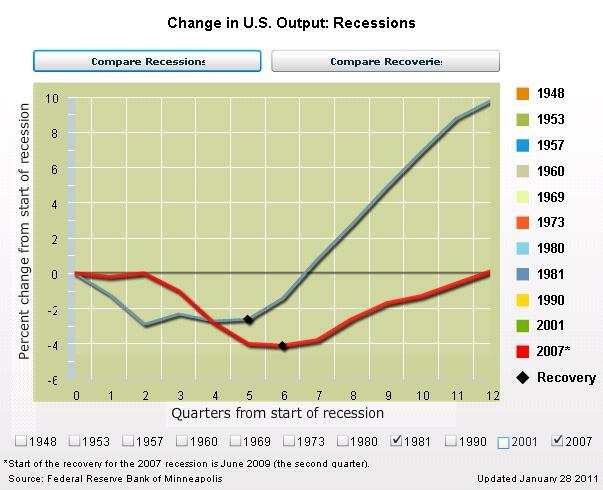 Under Obama’s policies, by contrast, we’ve just barely gotten back to where we were when the recession began. Unlike past recessions, we haven’t enjoyed a strong bounce. And this means we haven’t recovered the output that was lost during the downturn. Indeed, I made this point several months ago when analyzing some work by Nobel laureate Robert Lucas. And it’s been highlighted more recently by James Pethokoukis of the American Enterprise Institute and the news pages of the Wall Street Journal. Unfortunately, the jobs chart is probably even more discouraging. As you can see, employment is still far below where it started. This is in stark contrast to the jobs boom during the Reagan years. So what does this mean? How do we measure the human cost of the foregone growth and jobs that haven’t been created? Writing in today’s Wall Street Journal, former Senator Phil Gramm and budgetary expert Mike Solon compare the current recovery to the post-war average as well as to what happened under Reagan. If in this “recovery” our economy had grown and generated jobs at the average rate achieved following the 10 previous postwar recessions, GDP per person would be $4,528 higher and 13.7 million more Americans would be working today. …President Ronald Reagan’s policies ignited a recovery so powerful that if it were being repeated today, real per capita GDP would be $5,694 higher than it is now—an extra $22,776 for a family of four. Some 16.9 million more Americans would have jobs. By the way, the Gramm-Solon column also addresses the argument that this recovery is anemic because the downturn was caused by a financial crisis. That’s certainly a reasonable argument, but they point out that Reagan had to deal with the damage caused by high inflation, which certainly wreaked havoc with parts of the financial system. They also compare today’s weak recovery to the boom that followed the financial crisis of 1907. But I want to make a different point. As I’ve written before, Obama is not responsible for the current downturn. Yes, he was a Senator and he was part of the bipartisan consensus for easy money, Fannie/Freddie subsidies, bailout-fueled moral hazard, and a playing field tilted in favor of debt, but his share of the blame wouldn’t even merit an asterisk. My problem with Obama is that he hasn’t fixed any of the problems. Instead, he has kept in place all of the bad policies – and in some cases made them worse. Indeed, I challenge anyone to identify a meaningful difference between the economic policy of Obama and the economic policy of Bush. Bush increased government spending. Obama has been increasing government spending. Bush adopted Keynesian “stimulus” policies. Obama adopted Keynesian “stimulus” policies. Bush bailed out politically connected companies. Obama has been bailing out politically connected companies. Bush supported the Fed’s easy-money policy. Obama has been supporting the Fed’s easy-money policy. Bush created a new healthcare entitlement. Obama created a new healthcare entitlement. Bush imposed costly new regulations on the financial sector. Obama imposed costly new regulations on the financial sector. I could continue, but you probably get the point. On economic issues, the only real difference is that Bush cut taxes and Obama is in favor of higher taxes. Though even that difference is somewhat overblown since Obama’s tax policies – up to this point – haven’t had a big impact on the overall tax burden (though that could change if his plans for higher tax rates ever go into effect). This is why I always tell people not to pay attention to party labels. Bigger government doesn’t work, regardless of whether a politician is a Republican or Democrat. The problem isn’t Obamanomics, it’s Bushobamanomics. But since that’s a bit awkward, let’s just call it statism. Ronald Reagan would have been 100 years old on February 6, so let’s celebrate his life by comparing the success of his pro-market policies with the failure of Barack Obama’s policies (which are basically a continuation of George W. Bush’s policies, so this is not a partisan jab). The Federal Reserve Bank of Minneapolis has a fascinating (at least for economic geeks) interactive webpage that allows readers to compare economic downturns and recoveries, both on the basis of output and employment. The results are remarkable. Reagan focused on reducing the burden of government and the economy responded. Obama (and Bush) tried the opposite approach, but spending, bailouts, and intervention have not worked. This first chart shows economic output. 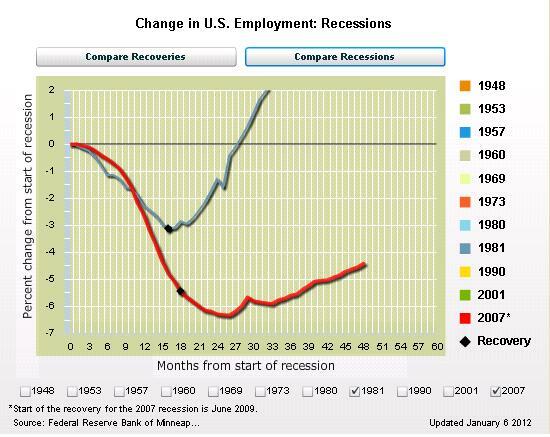 The employment chart below provides an equally stark comparison. 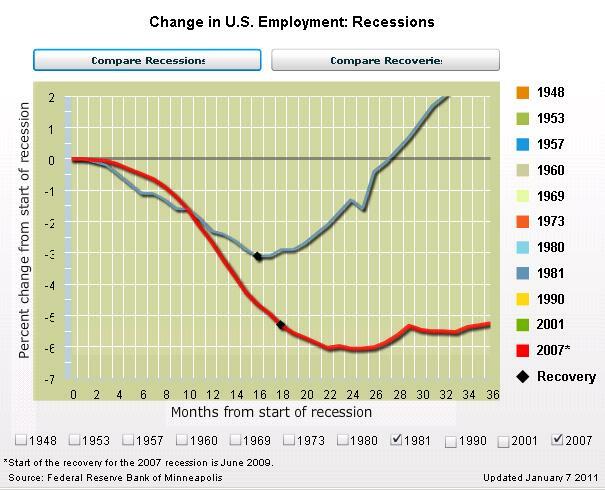 If anything, this second chart is even more damning since employment has not bounced back from the trough. But that shouldn’t be too surprising. Why create jobs when government is subsidizing unemployment and penalizing production? And we already know the so-called stimulus has been a flop. *Though he may not be the best President of the 20th Century. Where are the ’60s Hippies Now that They’re Needed to Fight Keynesianism? Keynesian economic theory is the social-science version of a perpetual motion machine. It assumes that you can increase your prosperity by taking money out of your left pocket and putting it in your right pocket. Not surprisingly, nations that adopt this approach do not succeed. Deficit spending did not work for Hoover and Roosevelt is the 1930s. It did not work for Japan in the 1990s. And it hasn’t worked for Bush or Obama. The Keynesians invariably respond by arguing that these failures simply show that politicians didn’t spend enough money. I don’t know whether to be amused or horrified, but some Keynesians even say that a war would be the best way of boosting economic growth. Here’s a blurb from a story in National Journal. America’s economic outlook is so grim, and political solutions are so utterly absent, that only another large-scale war might be enough to lift the nation out of chronic high unemployment and slow growth, two prominent economists, a conservative and a liberal, said today. Nobelist Paul Krugman, a New York Times columnist, and Harvard’s Martin Feldstein, the former chairman of President Reagan’s Council of Economic Advisers, achieved an unnerving degree of consensus about the future during an economic forum in Washington. …Krugman and Feldstein, though often on opposite sides of the political fence on fiscal and tax policy, both appeared to share the view that political paralysis in Washington has rendered the necessary fiscal and monetary stimulus out of the question. Only a high-impact “exogenous” shock like a major war — something similar to what Krugman called the “coordinated fiscal expansion known as World War II” — would be enough to break the cycle. …Both reiterated their previously argued views that the Obama administration’s stimulus was far too small to fill the output gap. Two additional comments. First, if Martin Feldstein’s views on this issue represent what it means to be a conservative, then I’m especially glad I’m a libertarian. Second, Alan Reynolds has a good piece eviscerating Keynesianism, including a section dealing with Krugman’s World-War-II-was-good-for-the-economy assertion. Here’s a clever video produced by the Winston Group, comparing the tax policies of two Democratic Presidents. Having previously highlighted Kennedy’s tax-cutting approach, it is painful for me to observe the class warfare approach of the Obama Administration. What’s especially fascinating is that JFK intuitively understood the Laffer Curve, particularly the insight that deficits usually are the result of slow growth, not the cause of slow growth. The Free Market Mojo site asked me a number of interesting questions about public policy. I’m not sure all of my answers were interesting, but here are some snippets that capture my curmudgeonly outlook. I think it’s important to divide the topic into two issues, the policies that cause short-run fluctuations and the policies that impact long-run growth. Generally speaking, I try to avoid guessing games about what is happening today and tomorrow (or even yesterday), and instead focus on the policies that will boost the economy’s underlying productive capacity. …the Fed’s easy-money policy was a mistake. If the central bank had behaved appropriately, we presumably would not have suffered a financial crisis and recession. And if we go back in history, we find the Fed’s fingerprints whenever there is an economic meltdown. …I would not want the government to impose a gold standard. Competitive markets should determine the form of money and/or what backs up that money. Perhaps gold would emerge in such a competitive system, but a gold standard should not be imposed. …I don’t trust politicians. They would pass a bill to impose a VAT while simultaneously phasing out the income tax over a five-year period. But inevitably there would be some sort of “emergency” in year three and the income tax would be “temporarily” extended. When the dust settled, temporary would become permanent and we would be a decrepit European-style welfare state. …There are many great economists, but for my line of work, Milton Friedman has to be at the top of the list. He had an incredible ability to explain the benefits of liberty and the costs of statism in a way that reached average people.